OK, not literally. 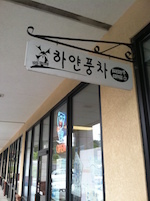 But I do live in Duluth, the heart of Korean-speaking Georgia, and today I went to a language exchange in a Korean bakery to practice speaking the language. With Korean things all around me, I sure felt like I was in Korea! It was the first time I had really spoken Korean with human beings, and although I am very limited on what I can say, it was challenging and exciting to me. And the cool thing is that now I feel like I have a context for the Korean language. Let me explain what I mean. Up to this point, Korean has been a language that I hear on the radio, in the audio lessons I am following, and in music I listen to. But the brain loves connexions, and Korean didn’t have a connexion to real people or a real place. Now my Korean experience has truly begun, and the language has come alive to me in the people I know who speak it and the places where it is spoken. Now that I’ve had this experience, I believe it will make learning the language much more interesting, and I believe I will be more motivated. No longer is Korean a jumble of topic marking particles, counter words, and implied pronouns. It’s a beautiful language used by people who live and work all around me, and I’m excited to discover their world!